The other day three new books arrived at our house by international post from the United Kingdom. 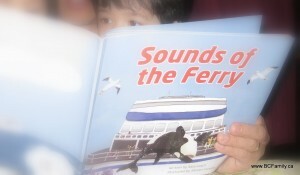 It was such a significant event in our day that our toddler figured out how to tell us, later on, that the books had arrived in the mail. We retrieved the package and marveled again over how they had arrived. If there ever was a house that doesn’t need another book, it’s ours. We have book shelves and baskets all over the house. In our family room alone we have three book stations plus a book table. You could say it’s not a surround sound, multi-media room but it is surround books. 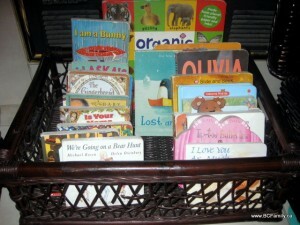 This simple book basket contains delicate three part flip books, pop up books and larger books. It’s located on the floor where the children are always digging into it. It’s also located near their potty toilet so that they can sit on the toilet and read. Don’t worry about hygiene! Not much action happens on said toilet these days, but lots of reading takes place. 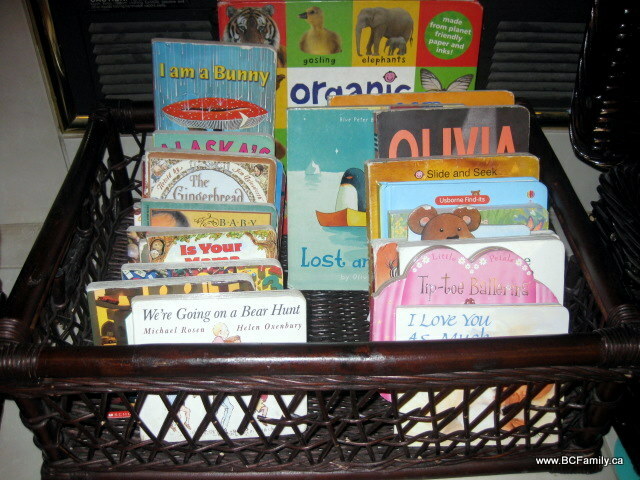 All of the board books are kept in this basket on the floor. 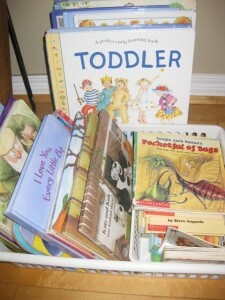 It’s located in a line up of three baskets that are used to store toys and books. (The other two baskets have lids on them.) All three baskets are located on the floor by the wall. In the evening, after the children go to bed, the toys and books are tucked away and the adults can feel like they aren’t in a playroom. We purchased the basket for 75% off at the Bay in the days before our children were born. It’s never been put to better use. Eventually we will pass them along to another family or a local thrift store. The great thing about board books is that you can wipe them down and clean them up before passing them along. We use Melaleuca’s Tough and Tender to clean board books. 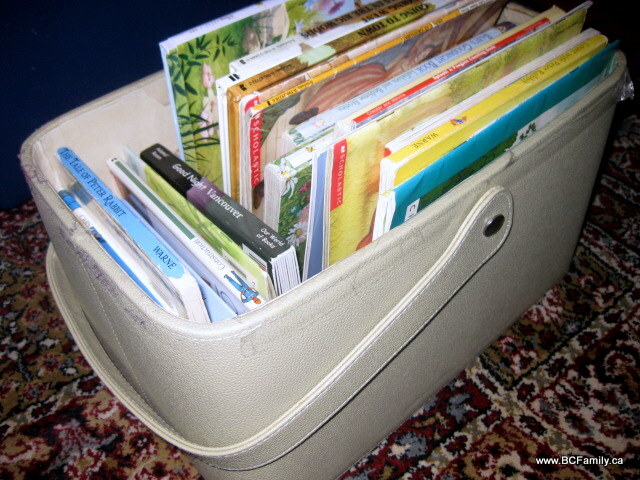 We keep a third stash of books in this leather container. It was purchased for 75% off at Sears and has turned out to be a great purchase as it can withstand a lot of use. It contains early Laura Ingalls Wilder stories, books about numbers and letters and poetry books, for example. We keep it near two child-size leather armchairs that our toddlers use. The kitchen table has become a book table during the day and evening, when it is not in use. We place beautiful books, recent purchases or books we want to feature on this table. A solar powered owl presides over the books. As the children play with stackable In the Night Garden wood puzzles at the window sill, they stop at the table to flip through the books. 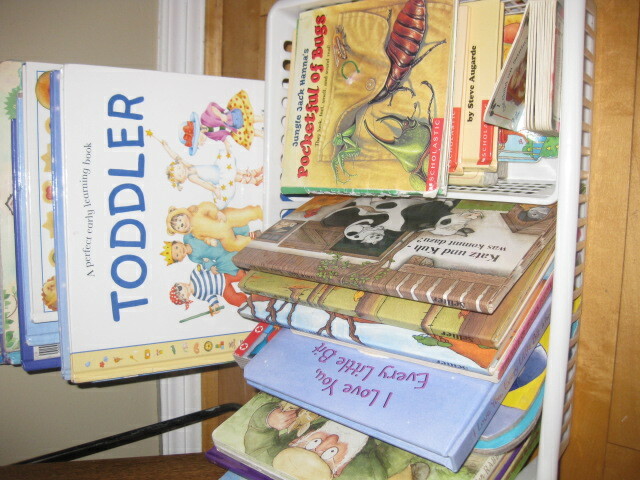 We also have a small container of books in their playroom downstairs and a bookshelf with resource books for mum. Another set of three shelves with hard cover books and other books is used daily. In our office there is also a shelf that contains early 20th century children’s books. Eventually the children will also have books in their rooms. We are fortunate to have friends and family who either give us new books or pass along books that they no longer need. It also helps if you have a background in Montessori education and a large personal collection of books. Even if you don’t have this scenario going on, you can set up a book corner with a basket or book shelves and put a rotation of library books inside, along with any books you have purchased. Your set-up doesn’t have to be worthy of a Pinterest pin! Book Warehouse, grocery store bins, Liquidation Warehouse, garage and church sales and the second hand section on Amazon are great places to find affordable new or almost new books. At the library you can get books, magazines and even CDs and DVDs for children. We like to check out Puntamayo and French language music CDs from the main library in downtown Vancouver. For the early reader set we like fiction and non-fiction books about numbers; letters; animals; how the world functions; flip books; books with textures and sound buttons; flap and sliding component books; pop out books; books about the naturalworld and animal kingdom, the life of children and families; and, poetry and spiritual books. We also like books about cooking, art and books that are written in specific parts of the world. 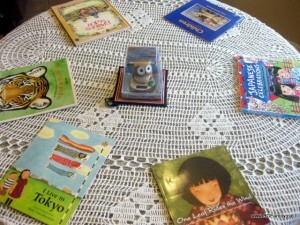 For example we enjoy books written in British Columbia, the Caribbean, Africa and Japan. Some of our books don’t have any words at all and some are very old. For the most part the books have detailed, gorgeous illustrations that are realistic. A few of them are fantastical – such as Peter Rabbit books – but most are focussed on stories about real life. Many feature gorgeous illustrations of the natural world. Our favourite illustrators are Beatrix Potter, Jane Dyer and Satomi Ichikawa. A book is the perfect gift in our household and generates a lot of interest and excitement. Books bring so much joy into our home and we feel blessed to have the opportunity to read books as we do. How do you have books set up at your home and what kinds of books does your child like to read for his or her age level?